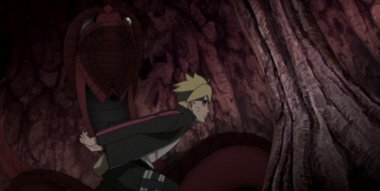 Determined to get their hands on the Gekirin via whatever means necessary, Boruto teams up with the others to try and corner Garaga. But Garaga’s ability to accurately detect the location of his opponents and the ability to change them into stone forces Boruto into a hard battle. Amidst the battle, Boruto and his friends recall a strangeness in Garaga’s movement and form a strategy according to that, and are finally able to corner Garaga. Then, Boruto raises a certain proposal to Garaga.